Unclaimed bodies are supposed to be buried in marked graves with proper identification, but most end up in mass burial sites, without identification, beside heaps of trash. 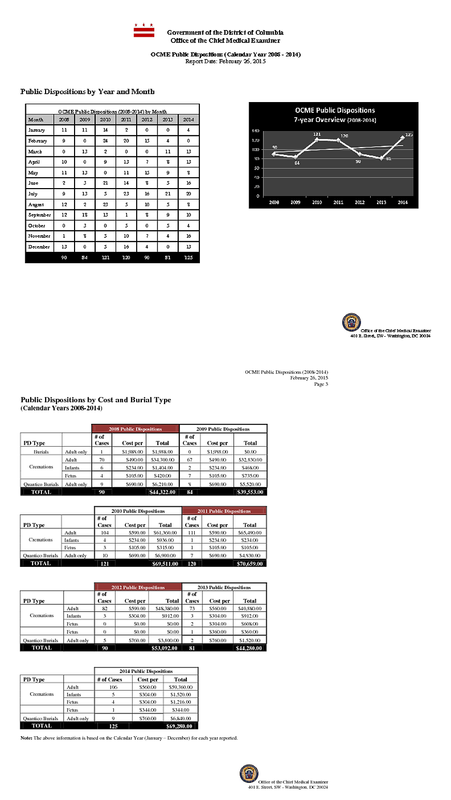 According to the CDC, there were 5,337 deaths in the District of Columbia last year. One hundred twenty-five of those bodies were left unclaimed. This occurrence is not uncommon: With depressing regularity, local authorities encounter situations every year where next of kin are unwilling or unable to pay for burial services, or simply can't be reached. There is no nationwide standard for what happens next. In Los Angeles County, which has one of the best-known public burial programs in the country, the coroner holds the body for about a month before cremating any unclaimed bodies. The cremated remains are held for up to three years before they are poured into a mass grave with a single marker for the year of death at an annual county-sponsored interfaith ceremony. In Maryland, unclaimed bodies are turned over to the State Anatomy Board if no one can be located through a "reasonable search" to claim the body after 72 hours. The cadavers are then used for medical research alongside those of other body donors. Maryland state officials also pour cremated remains from each year into a single grave and hold an annual ceremony every June honoring their contribution to science. In Virginia, some counties pay for individual burials for unclaimed bodies. But that's not actually what happens to unclaimed bodies in DC. In reality, the cremated remains are buried in an unmarked grave in a Baltimore cemetery; several hundred more from years past are located in a similar unmarked gravesite in Alexandria, Virginia. From what I could tell, the names of the cemeteries do not appear on any publicly available DC government website, nor are they listed in the agency's annual reports. So I submitted a FOIA request, spanning from 2008 to the present, to figure out where the bodies are buried. According to the documents provided to me on behalf of OCME, the cremated remains were buried in Coleman Cemetery in Alexandria, Virginia, from 2008 to 2013. Since then, they have been buried in Mt. Carmel Cemetery in Baltimore. After subtracting the bodies of veterans (which are buried in a separate process at Quantico), these two cemeteries account for 660 sets of cremated remains from the DC public dispositions program at a cost to taxpayers of over $350,000—with not a single above-ground marker between them to inform visitors of what lies beneath. Coleman is a small, historically black cemetery located in an affluent part of Alexandria, across the Potomac from Washington. Findagrave.com lists 1,149 interments there, which seems about right based on my own visit. It's a fairly austere place with no on-site office and no phone number listed online. Tacked onto the side of a storage room, however, is the phone number for Ron Reaves, the point of contact for the cemetery. When I called Reaves, he gave me instructions on how to locate the unmarked area at Coleman where public dispositions provided by W. H. Bacon were buried. In several areas, the graves are either hidden behind trees and weeds or next to heaps of trash. He said there were "about five or six" burial containers which he estimated each had 50 to 60 sets of individual cremains (although when I provided my own higher estimate for how many sets of cremains were there, he seemed to agree). Reaves told me the cremains boxes are six inches high by four or five inches and that "[W. H. Bacon] just put a bunch of 'em in a casket or some kind of container and brought them out there and buried them. They were trying to find the least expensive way of entombing the bodies." When I asked him if someone could come back and retrieve a specific set of cremated remains, he told me, "At this point, it would be very, very, very difficult. You could probably locate the vault that they were in, but there's paper writing on the top of each one of the cremains [and] every cemetery is waterlogged. It would be virtually impossible to locate after so many years and tell who's who." Mt. Carmel, where unclaimed bodies have been buried since 2014, is just south of Interstate 95 in Baltimore. It's a much larger operation (Findagrave.com lists 5,854 interments) with an on-site crematory and an office in a nearby trailer that stays open on weekdays. The chain-link fence on its southern side is rusty and full of sections that are pried apart. In several areas, the graves are either hidden behind trees and weeds or next to heaps of trash. Like at Coleman, the burial location is completely unmarked, discernible only by a bit of ground discoloration if you really know what to look for. According to the staff, there are two burial vaults with individual cremains provided by W. H. Bacon inside each of them. Mt. Carmel staff also said that, at their request, W. H. Bacon purchased a special liner to protect the cremains from the elements—although they stressed that Mt. Carmel's responsibility was only to take the cremains and bury them. The staff member did not seem to have a full awareness that these were public dispositions from the District. Slocum added that he didn't have enough information to opine on how fair a price this was. "It would be hard to say how fair the price is without knowing if they own a crematory," he said. "It's a question of whether the prices Bacon charges are reasonable given their costs, or if they've low-balled the price and decided to skimp on the identification and markers at the end. Were I in charge of this budget item, I'd want to know the details." For their part, W. H. Bacon didn't have a whole lot to say about all this. When I put the question to Wendell Bacon, who works at the funeral home and whose mother owns it, he said he felt that the work is being done according to the contract, but told me he was not allowed to discuss it in detail. Another W. H. Bacon staff member told me the same thing. It's fair to ask whether the current requirements in the scope of work that require marking and retrieval of individual remains in perpetuity are perhaps largely unnecessary. The question of how many people actually come back to claim the remains of their next of kin after 30 or more days have passed is largely an empirical one, the answer to which can inform how these remains are labeled in public. (The answer is not very many.) It's also important to consider the broader question of why one out of every 42 dead bodies in the District is unclaimed in the first place, left to be buried and cremated by the city. By comparison, LA County's ratio—considered on the high end nationwide—is one in 38. However, that discussion is entirely separate from the question of whether the District's current vendor is following the terms stated in their contract for public dispositions. More broadly, the practice of burying hundreds of cremated remains of the District's unclaimed bodies using unmarked graves in hard to find locations reflects poorly on the nation's capital. For his part, Ron Reaves doesn't want to wait for someone else. He told me he was planning on spending about $500 from his own pocket to put some grave markers in the area at Coleman where the DC public dispositions currently reside. When I asked him why, he said, "Why not? This is a historically black cemetery. It's the humane thing to do. I would suspect that most of the people who have been picked up in the District and eventually been cremated—I'd say 95 percent—were probably black folks. We want to create a really nice place there and hopefully be able to set it up in such a way that 50 years from now, or 100 years from now, someone will still be taking care of the place. And you know... be proud of it." Jenniffer Masterson contributed reporting to this story.